Live chat quality assurance is an integral part of providing a consistent, outstanding service here at The Chat Shop. Yes, we spend hundreds of hours training new live chat agents so that they become a live chat expert. Yes, each agent must score 100% on multiple tests (on each client) before they start chatting. And yes, training never actually stops; agents learn new chatting skills and new integrations frequently. But it is our Quality Assurance Process that ensures every agent is living up to the high expectations that we set. Our process ensures that each agent is providing the best that they can for each client and each visitor that they chat to. They allow us to make sure that agents are progressing conversations in a suitable manner, that they have accurate resources available to them, that they use an appropriate tone of voice and that they not only achieve the client’s goals but go above and beyond for them and their visitors. Our Live Chat Quality Assurance Process is a set of weekly tasks for Live Chat Agents and their Team Leaders. We use more than 20 qualitative and quantitative metrics to analyse agents’ chats. On Mondays, Team Leaders use our custom-built reporting software to assess the quantitative performance of our customer support agents. Our Team Leaders assess key performance indicators (KPIs) that are critical to the overall performance of live chat and KPIs that are important to specific clients and the service that we provide to them. We use live chat for far more than just great customer service, so KPIs vary client by client to reflect their business and live chat goals. For some clients we measure the chat-to-lead rate or the chat-to-resolution rate, for example. We often delve even deeper… measuring chat-to-lead for a specific service or referral link, to help analyse the performance of marketing campaigns or a specific aspect of live chat. The statistics that we measure are based on the goals that we set with our clients. KPIs that are critical to the overall performance of live chat include first response time, average response time and customer satisfaction. Customers expect quick and effective support via chat and these metrics are a basic measure of whether these expectations are being met. These performance indicators are measured industry wide also, so they give us a good opportunity to compare our performance – we’re strides ahead, of course. Whilst first response time has got quicker globally, the global average still stands at just under 1 minute (58 seconds to be exact). Our average first response time is 27 seconds. Team Leaders assess their Live Chat Agents’ response times across clients, every week; if an Agent is taking longer than 40 seconds to respond then the Agent and their Team Leader must take action. The Agent and their Team Leader will work together to consider how response times can be reduced. Did they not know the answer to a question? Can we improve the efficiency of our Knowledge Base or retrain the agent to know more? Was it a large piece of information that had to be conveyed to the visitor? Could the agent have broken the information down to bite size chunks and/or communicated the delay with the visitor? When the chat first started, did the agent give the visitor attention? Setting high expectations from the start of a chat is important to us. A quick first response sets the customer up for a positive chat experience. 40 seconds is our target response time but our actual average response time is far lower due to our desire to always improve. Our weekly Live Chat Quality Assurance Process helps us to operate a kaizen process. Every week we carry out more training, make alterations to our strategy and look for other ways to get better. We log all of the data so that we can track the progress of this kaizen process. Customer satisfaction allows us to determine whether website visitors get what they want from live chat. Even if a Live Chat Agent handles a visitor’s request in a quick and friendly manner, it does not mean that their expectations have been met. A customer may receive all responses in under 40 seconds but that does not mean that all of their expectations have been met. Our target customer satisfaction level is 97% but thanks to the hard work of our Agents, Team Leaders and the rest of the operations team, our average customer satisfaction rating for 2015 is a fantastic 98%. If an agent was to achieve a customer satisfaction rating of less than 97% then we would need to determine why. As we’ve said, response times aren’t the only factor influencing customer satisfaction. The way in which agents use their personalities within chat is also important. Live Chat Agents need to show enthusiasm in every chat; enthusiasm for helping the website visitor provides a great experience for both parties. That’s why we refuse to use scripts to guide Live Chat Agents. To create customer satisfaction you have to really engage with website visitors every time that you interact with them. Reading messages properly and responding appropriately is also critical to achieving 99% satisfaction. Feeling like you aren’t being listened to because a customer service agent has skimmed past part of your question or is not knowledgeable enough does not deliver an outstanding experience. Our Live Chat Quality Assurance Process allows us to track our KPI performance…most importantly though, we don’t accept achieving these targets as being enough. We hit our 30 second average response time target and kept improving…and it’s the same for all other KPIs. We track everything that we do and review all data on a macro and micro level at least weekly. Our Qualitative Live Chat Quality Assurance Process allows us to dig a little deeper into whether an Agent is meeting customer and client needs. If a Live Chat Agent’s customer satisfaction rating was to dip below our target rating then the Qualitative Process would reveal why. Even if an Agent has a rating of 100% however, we still carry out the Qualitative Live Chat Quality Assurance so that we can assess every aspect of live chat. And we want to see why this agent’s live chats are so good, so other agents can pick up skills and techniques from their co-workers. You might be thinking “how many aspects can there be?” Well a 10 to 12 question live chat script is a far cry from what we deliver, so there are a lot of angles to be considered. Checking for quick responses and factual answers is not enough; to us, live chat is so much more than a simple question and answer service. Through the personal interactions that our Live Chat Agents create, we develop relationships between clients and prospects, generate qualified leads, make perfect product recommendations, guide visitors through the buying cycle and convert visitors into customers. There are many aspects vital to providing the standard of live chat conversations that our clients expect. We build conversations and relationships, so aspects such as tone, conversation structure and client goals are very important. Each and every chat must aim to achieve a client-specific goal as well as stand out as a fantastic experience for the visitor. 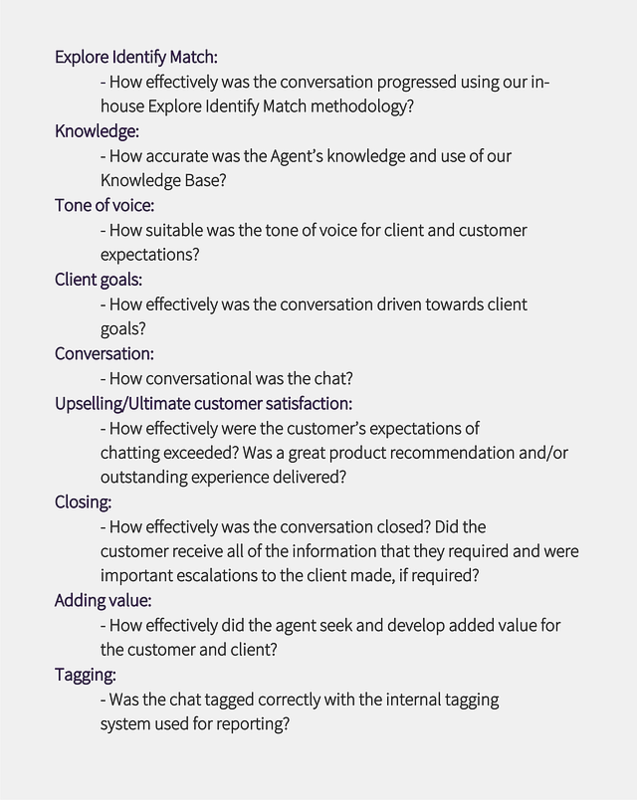 Every week Agents and their Team Leaders analyse a number of the Live Chat Agent’s best and worst chats from the previous week. Chats are selected each Monday and by Friday both will have reviewed the chats and shared comments on their performance. Each of the above aspects of chat are scored out of 10 and Agents and their Team Leaders discuss each to see how they could have performed even better. A chat that received a ‘thumbs up’ from the website visitor, had a quick response time and generated a qualified lead could still have room for improvement. Was the information accurate for the visitor’s specific situation? Did the tone of voice match the client’s brand? Were there any spelling or grammar mistakes? When we hire new Live Chat Agents we select individuals that are self motivated; our Live Chat Quality Assurance Process encourages Agents to self critique. This way we can highlight disparities between the Agent’s views and the Team Leader’s views. We coach our agents so that they can be better, not just tell them what to do. Agents also know that they aren’t disciplined just because a chat is imperfect – they are encouraged to bring imperfect chats to our attention, so that we can help them to grow. So why do we go to all of this effort? Committing hours of our time each week to review every Live Chat Agent and a sample of their chats (a sample that includes hundreds of chats). We’re not satisfied with just being the best and staying where we are. We always want to grow as a service and a team, and be better. This is an integral part of the service that we deliver and the idea and culture that The Chat Shop was built upon. We don’t just stick a piece of code on a client’s website and hope for the best. We analyse the website in detail (weekly) and look for ways in which we can improve website performance, convert more visitors and help more customers. We don’t just use a couple of proactive greetings, we keep adding and adjusting them to smash our clients’ goals. Live Chat Agents must complete weeks of training before going live on chat and score 100% on their training tests. And training never really stops, they have top-up training frequently as part of our kaizen approach to quality. And this is just a snippet of what we do, with our lengthy Live Chat Quality Assurance Process being the icing on the cake. This process ties all of our hard work together, allowing us to see where we need more training and how we can exceed our goals. Want to know more about putting our well trained Agents and thorough Live Chat Quality Assurance Process to work on your website? Our Live Chat Agents providing outstanding customer experiences, increase conversion and generate highly qualified leads. Find out more about how our live chat outsourcing services could help your business to succeed.